This Classic Reflection movie review is by one of Cinema Static's guest writer Sybil Vasche. For those who have never seen The Nightmare Before Christmas, this delightful film from Tim Burton (producer and writer), the weirdo guy who started out at Disney as an artist, you're in for a treat. NIGHTMARE BEFORE CHRISTMAS clothing, games and movies. The movie was actually filmed in a warehouse in San Francisco using stop motion animation and features a musical score by long time friend and collaborator Danny Elfman (who started out in the music group Oingo Boingo). The story is about Jack Skellington, the Pumpkin King of Halloween town. Each year on Halloween the residence of Halloween town - witches, monsters, ghosts, vampires, etc. - celebrate with gusto. But at the start of our story, Jack is bored with his job and starts to question his own commitment and wonders if Halloweenland lacks meaning any more. He asks himself, is this all there is? He wonders through the town and forest and ends up in front of a group of trees. Each is marked with a symbol of a major holiday. He chooses the one that eventually leads him to Christmas Town. Finding Christmas Town gives him a deliciously wicked idea and thinks about making the Yuletide his own. 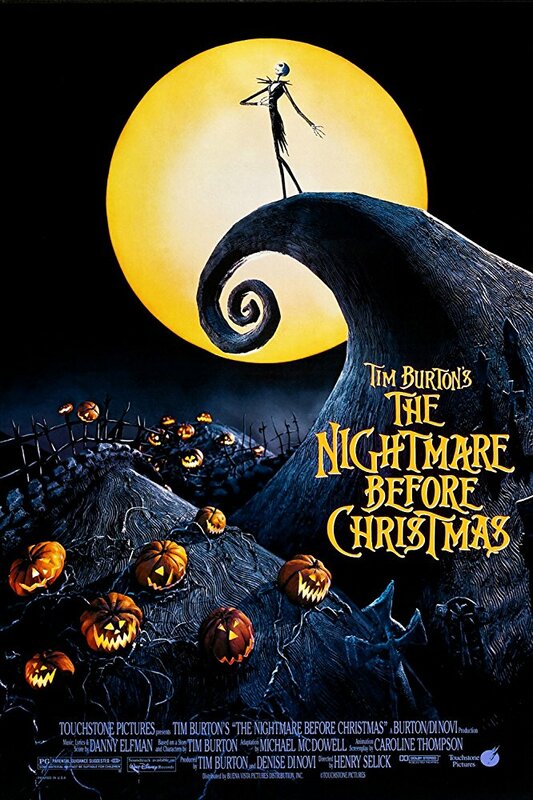 The film features the voices of Chris Sarandon (as Jack, but the singing is done by Danny Elfman), Cathrine O'Hara as Sally, William Hickey as Dr. Finklestein and Glenn Shadix (Beettlejuice) as the mayor of Halloweentown. The film recieved an 8/10 on IMDb & 94%/91% Critics/fans on Rotten Tomatoes. Honest Trailers Treatment of Nightmare Before Christmas, because, they're usually pretty funny and are good at making you laugh while calling it like it is.